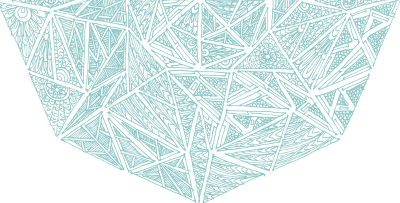 I haven't posted in BBC for as long as I can remember... but when the MOCing bug bites, it bites hard. 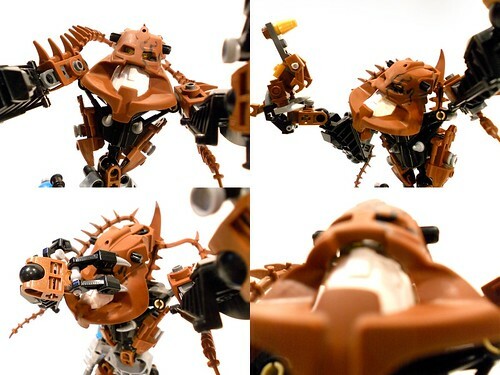 Sometimes there's nothing more fun than pulling out the old BIONICLE bin. Certain Brickfair acquisitions of mine - some useful new elements I bought, custom-painted parts, and prototypes from years past - only spurred on my desire to create. I can take this opportunity to point out that the custom-painted elements seen below (I Sharpied the Piraka spine myself) were done by MrCod. 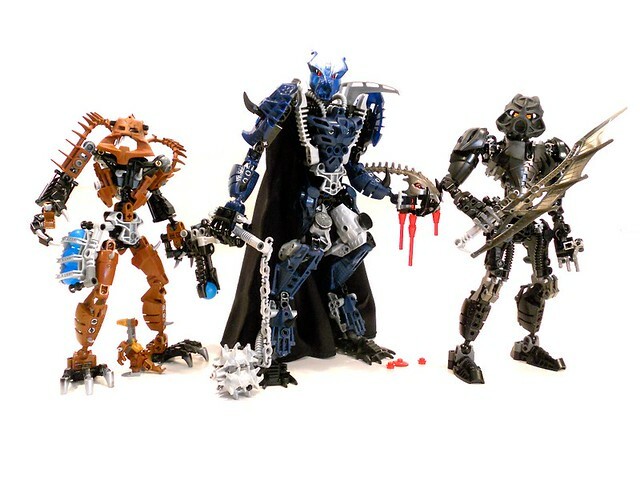 From left to right: Grokk, Uhuraz, and Heuani. Characters are built to scale with one another. 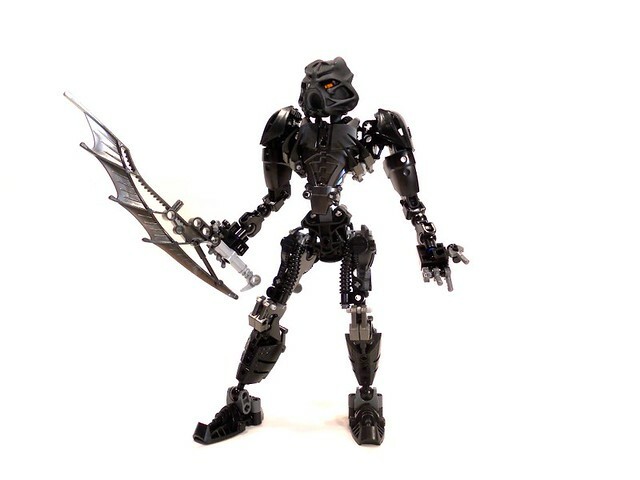 Heuani, Toa of Shadow. Sword is a prototype element; mask was custom painted. 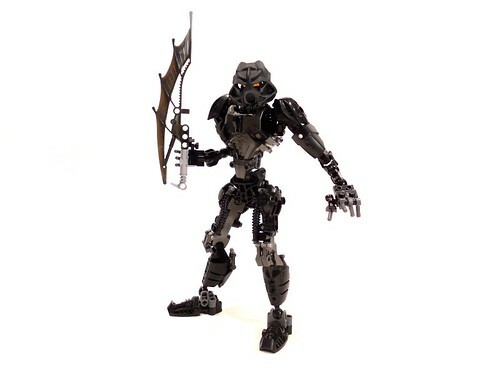 In the 2012 arc of the BZPRPG, the world of the game was very similar to Mata Nui in the BIONICLE canon in 2001. 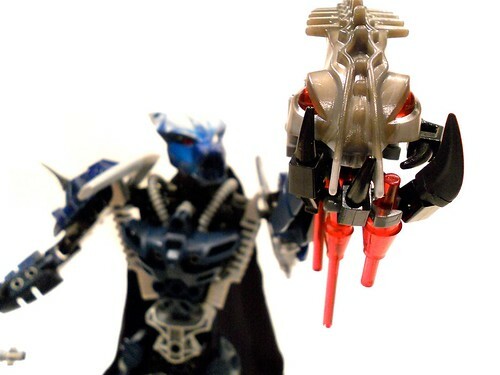 Similar, not identical; instead of triumphing over Makuta as they did in canon, the Toa Mata failed, because one of their number betrayed them at the crucial moment. 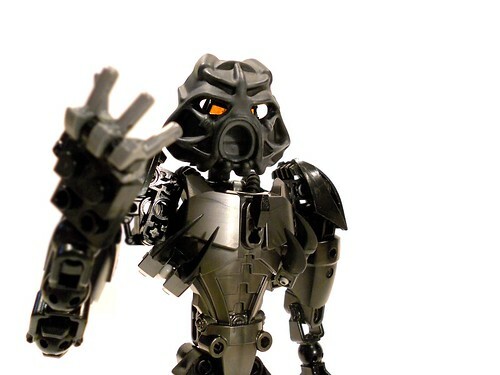 That Toa, once he submitted himself to serving Makuta, was warped into the hateful persona of Heuani. He also died at the end of the 2012 arc. Heuani was a dark and seductive presence. 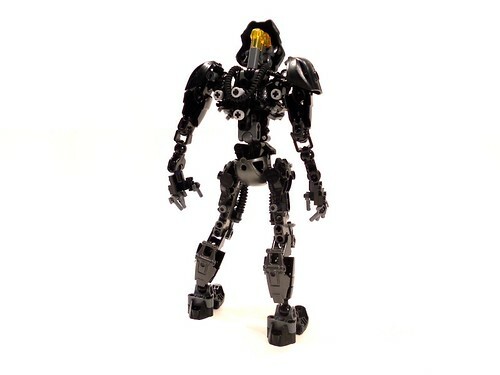 He was defined by his statuesque, lusty beauty, his honeyed words, and the dangerous shadow powers that Makuta endowed him with. 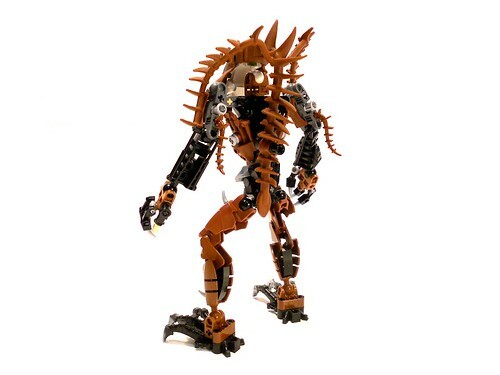 He was armed with a crystal flamberge and a Kanohi Felnas, both of which he used to devastating effect against dozens of his enemies and captures. He was at once alluring and repulsive. Vezok's Friend made a stunning artwork based on my descriptions of Heuani, capturing his enigmatic nature and appearance admirably. 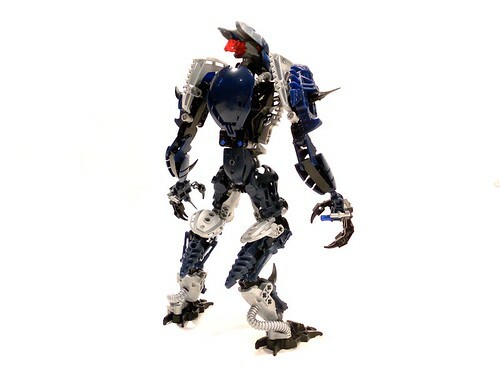 His artwork was my basic reference for my MOC of Heuani. There was no suitable piece for either a humanoid Felnas - Heuani's face had to be more attractive than Gorast's head! - or for the crystal flamberge, so I am very happy that I was able to have Heuani's mask specially painted to resemble VF's art. Heuani's sword here, while neither transparent, double-sided, nor ripple-bladed as it was in the game, was one of the coolest pieces I had, so I thought it'd have to do. Building challenges: getting the shoulders right, beefing up the thighs, torso stability. 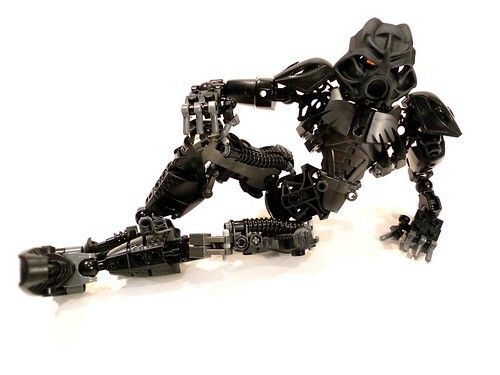 As good as he was at working for Makuta, Heuani's true calling was always to become a supermodel. Grokk, Skakdi of Gravity. Gold tooth was custom painted, spine was Sharpied. Included with Grokk is his Fusa Flipper, a wind-up toy. Grokk is the only character I've had for my whole time in the BZPRPG (2009-2013). He's the only character in this topic that hasn't died yet. If there's one distinctive thing about Grokk, it's his narrative voice. He is written in 1st person, which isn't altogether unique in the game; however, Grokk's blend of bad puns, incessant self-promotion, fourth wall breakage, and stray thoughts is generally distinguishable when it appears. Grokk is prone to whimsy, loves casual crime, and takes immense pride in his mouthful of "pearlies." Grokk's childish behavior, however, is belied by a conspicuous absence of moral relativity or empathy. He carries a Zamor pistol, and he's an excellent shot. The reference for Grokk is several artworks I've done of him, most recent of which can be seen in my Av and Sig. 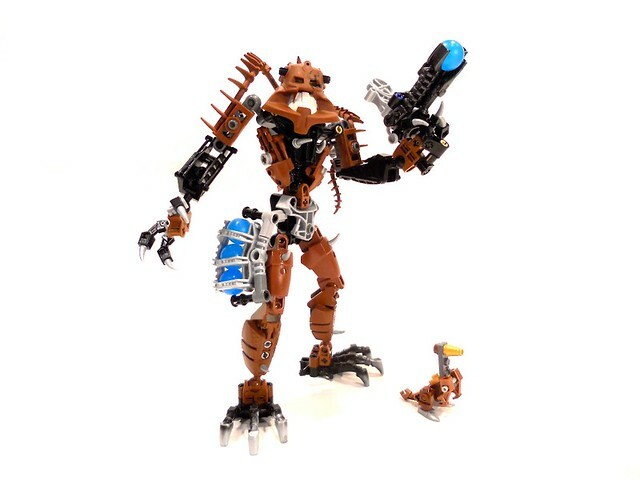 He's the smallest and the simplest of the MOCs in this topic; I wanted him to be stable and playable. 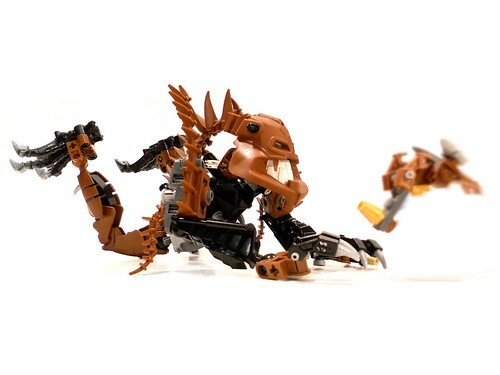 The little gizmo at Grokk's feet is a Fusa Flipper, which is a small wind-up toy that Grokk stole for his enjoyment during the current arc of the game. Building challenges: retaining torso flexibility, incorporating more brown, making a vaguely kangaroo-shaped contraption at the right scale. Towards the end of his photo shoot, Grokk discovered that he could, in fact, take pictures of himself: "#selfies #lol @dorshaddix"
Uhuraz, Makuta. Bleeding head is a prototype element; cape comes from a Darth Vader figurine. 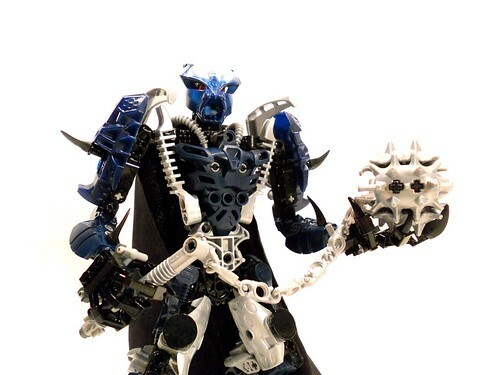 Makuta Uhuraz the Merciless was a character I played before the reboot of the BZPRPG. Uhuraz was one of my first characters; he was a fairly basic "big bad," but he was a load of fun to write. He ended himself at the close of the 2010 arc shortly after realizing his dreams and rediscovering his conscience. True to the first in his bloated list of titles, Uhuraz was merciless. 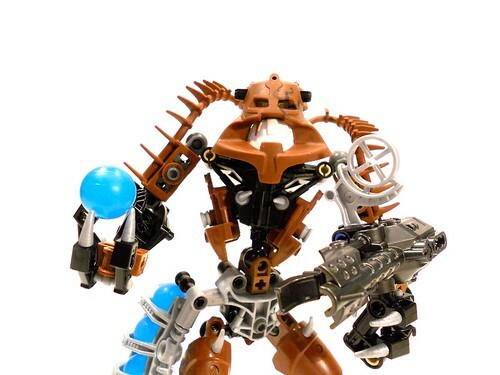 He was a savage hunter, prone to fits of destructive rage; armed with titanic brute strength and a heavy flail, his wrath often resulted in broken bodies. For all his power in the temporal world, though, Uhuraz's true power lay in his mind. Uhuraz was a masterful manipulator of the mental plane, especially when it came to attacking other consciousnesses. Uhuraz, supremely confident in his might-means-right world view, wanted to become a god. This is maybe the fifth update of my Uhuraz MOC, which has been at a few Brickfairs, but hasn't seen the light of the internet since it was much older and inferior. Building challenges: attaching the fingers to the ball joints, restructuring the leg armor. Let it be noted that "The Incredibles" had it right: several times during the shoot, Uhuraz's cape succumbed to my fan and pulled him the ground. Thanks everyone for looking! If you made it all the way down here, I'm surprised by your patience, and flattered by your interest. Comments and critiques of all sorts are appreciated. Okay, these are pretty awesome. You've added lots of nice details, and I especially like Heuani's waist rotation, Grokk's ammo belt and Fusa Flipper, and the plasma dripping from Uhuraz's hands. 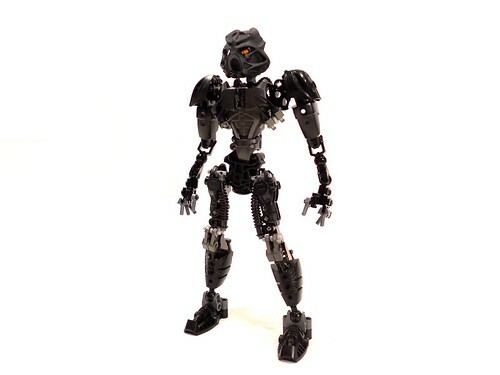 You've achieved a lot of nice angles and such, but the MOCs still feel "simple" (and not overly complex) in the way that these wouldn't look out of place in the Bionicle universe. The prototype pieces also add to this. Well done! Great job on all these. I have to say, Heuani looks really impressive with the prototype sword, and the armor and such are more nice additions. Grokk, as you said, looks quite simple, especially with the legs, but the ammo attachment and the toy thing are well made. 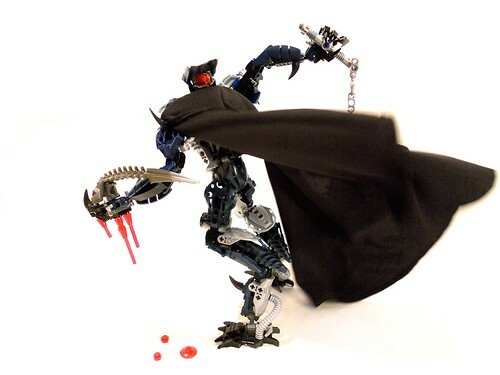 For Uhuraz, he looks somewhat intimidating with the cape and flail, and the clawed hands. The head is pretty frightening, somehow, it was creative for you to do that. Uhuraz: This fellow I remember fondly; he and my character Ballom got along well, back in the day. 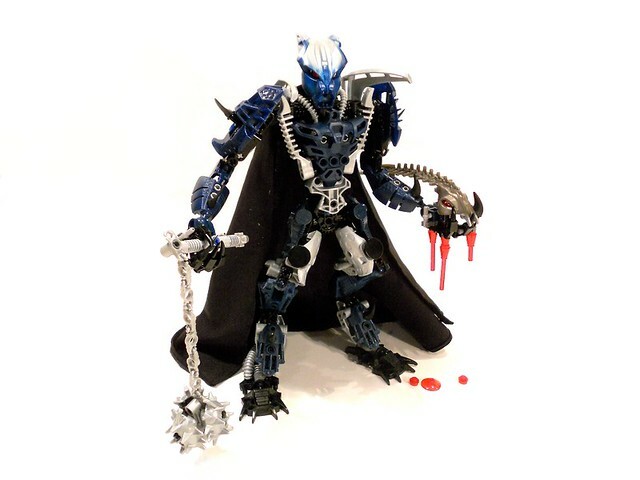 The use of Vamprah's mask to go with a silver, black, and blue color scheme was a good choice, and the additional black spikes you added to him make old Uhuraz seem even more menacing. His updated flail, which looks awesome, adds to his "Merciless" look. I also love the whole "Alas, poor Master" thing going on with your prototype Crast. 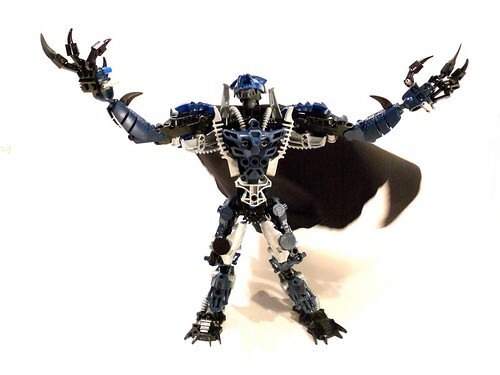 Those hands are a really cool custom design; could you please post instructions? Also, I am jelly of that Darth Vader cape. Heuani: How the heck do you say this guy's name? However it goes, he certainly looks as noble and threatening as your description made him out to be. 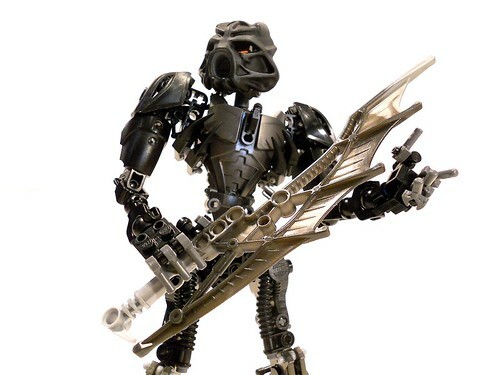 I especially like the tubes on his upper legs, the Rahkshi heads on his shoulders, and the Hero Factory chestpiece. And I am in awe of that black Gresh sword, which looks amazing. You have such great luck with prototypes, my friend. For this guy, I would also like to ask if you could please provide hand instructions. 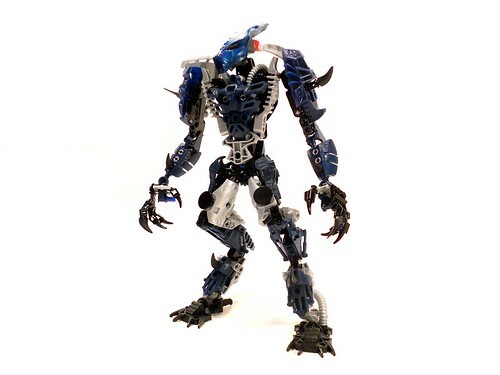 While I like the slimness of Heuani in general, though, I'm not a big fan of his bare Hero Factory bone lower arms. I would say armor them up in the smallest size of black HF cladding, if you have it (Pyrox has some on his legs, for example). And while that black Hau Nuva looks perfect, you do know that those come in black naturally, right? Grokk: Ah, brown, how rarely one sees thee nowadays. 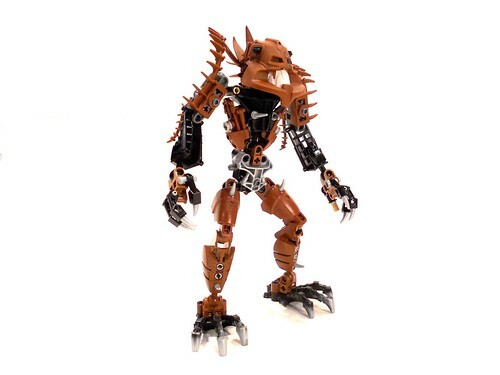 You picked a winner here -- a Piraka that looks remarkably distinct from Avak despite having many pieces from him. The addition of black helps, as does the leaner custom torso. I really like his custom Zamor weapons, and the gold tooth and black tatoos were excellently applied. His Fusa Flipper is also adorable. 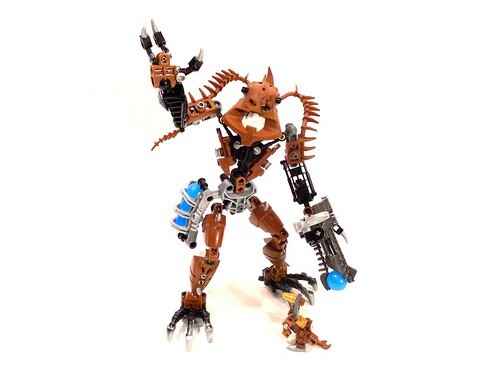 Thanks for sharing these guys with us, Nuju Metru, and I hope that the MOCing bug keeps biting you, as I always enjoy seeing your work. Simply put, these are glorious. Honestly, this isn't how I imagined them, but it's up to the creator of the character to truly decide how he/she imagines their characters. Good job Nuju!